Fairfield, CT - AAA Northeast has honored the Fairfield Police Department with a Gold Award for the department's outstanding traffic safety programs. In addition, AAA recognized Officer Scott Sudora as a department-nominated Traffic Safety Hero. At AAA's 9th Annual Community Traffic Safety Awards ceremony, AAA recognized the Fairfield Police Department for comprehensive community traffic safety programs that includes child passenger and occupant safety, distracted driving and DUI enforcement programs and a bicycle safety awareness program, among other initiatives. Officer Sudora, a member of the department’s Special Services Traffic Division, was recognized for his traffic safety work over the last three decades. He has routinely led the department in motor vehicle infractions, summonses and DUI arrests and participates in numerous traffic safety education programs including: Operation Living Street, Child Passenger Safety, and Commercial motor vehicle enforcement. In addition, Officer Sudora is a member of the Southern Fairfield County Traffic Unit, and one of a handful of CT Drug Recognition Experts who specialize in drugged/impaired driving enforcement and assists other agencies with arrests. AAA also recognized retired Fairfield Police Chief Gary MacNamara for his continued support of the club’s traffic safety mission over the years. 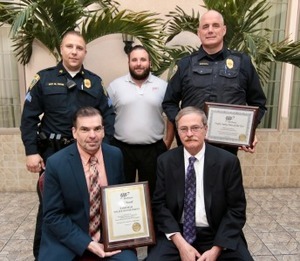 AAA Fairfield Branch Manager Mike Pamula (center) presented the Gold Award to Gary MacNamara, retired Fairfield Police Chief, (seated, left) and Chris Lyddy, Acting Fairfield Police Chief, (seated, right). Participating in the presentation included Fairfield Sergeant Mike Paris (standing, left) and Fairfield Officer Scott Sudora.